The information below is for reference only and is subject to change. Consult the Canada Flight Supplement for current data. Airport staff is permitted to transmit: wind direction and speed, altimeter setting, aerodrome traffic and aerodrome information. Rwy 16/34: grass, 2,010 ft x 70 ft. Summer only. 7 keys to a "High" intensity setting. Pilots may key up the Medium Intensity Approach Lights Sequenced Flashing (MALSF) on 123.5 MHz. The MALSF lights will be on for 15 minutes unless reselected. The rotating beacon is on from dusk to dawn. Overnight parking on a paved apron and tie down space is normally available. Check with the Airport Manager for current rates. Hangar space is very limited. Please advise of your requirement in advance. Radio: transmit on 126.7 MHz. 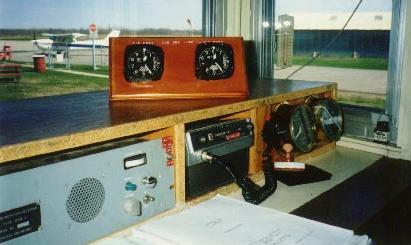 London radio (FISE) can usually be reached over Brockville at an altitude of 2,500 ft.
For a hard copy of weather and NOTAMs, ask Flight Service to fax you at the Brock Air, Brockville office 1-613-342-4588. A public telephone in the terminal entry is available from 7:30 AM to 4:30 PM. To open or close a flight plan on this telephone, dial 0 and tell the operator that you would like the following number: 1-866-WXBRIEF (992-1433). Every effort is made to have snow plowing completed by 8 AM. Check with your local Flight Service Station regarding runway surface condition reports or telephone the Airport Manager directly. A snowplow and snow blower are used to maintain the airport runway during the winter months. The grass runway, 16/34 is for summer use only.